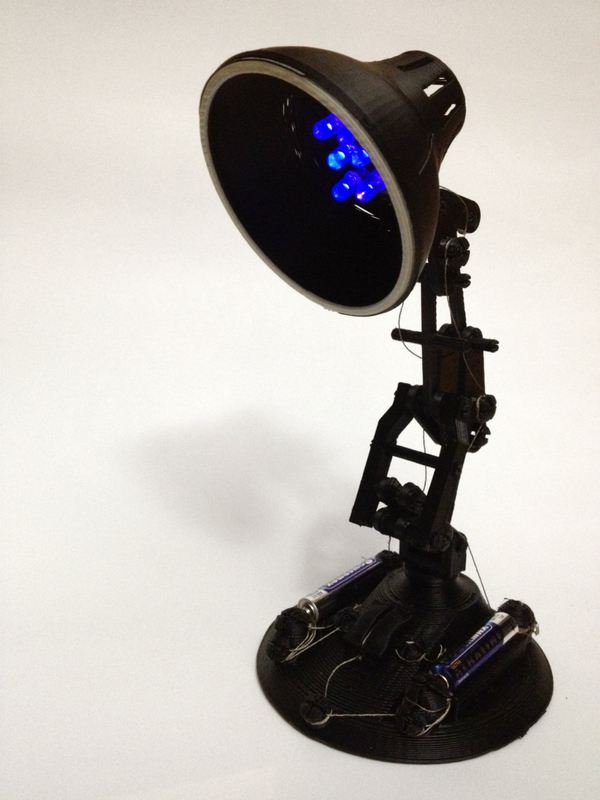 A no-solder, 3d printed, miniature anglepoise lamp in black and UV. Above, you can see my weekend project – a 3d printed, no-soldering-iron-required, LED using miniature anglepoise lamp. I printed it on Saturday, and assembled it on Sunday – it’s fitted with 6 UV LEDs (because I couldn’t find any white at the time) and the lamp shade has a thin accent line of glow-in-the-dark plastic as a highlight. 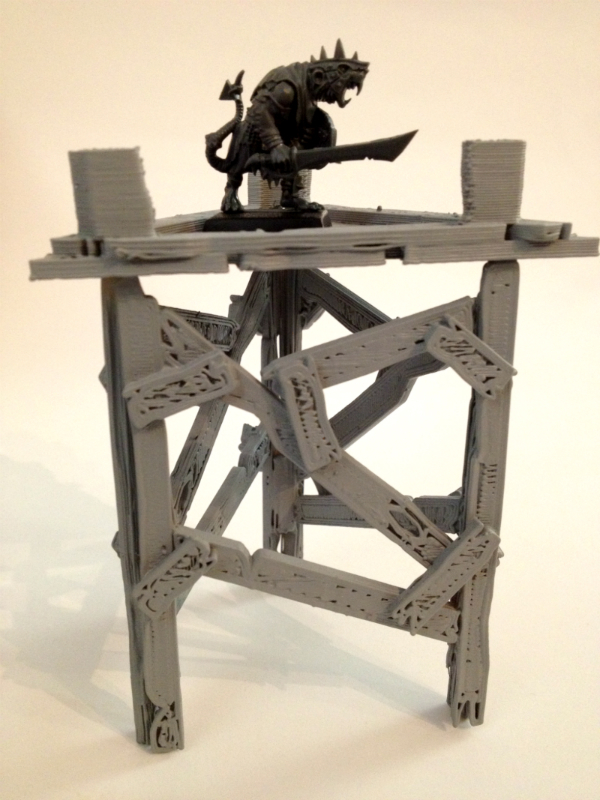 Bit of a weekend project – a 3d printable piece of Warhammer Fantasy Battle terrain. I keep flip-flopping on whether I like the texture – an artifact of the 3d printing process. It’s sort of interesting; a little reminiscent of wood, but different. So, I think it’s safe to say, I have a 3d printing ‘problem’. I love 3d printing – dodgy prints and wonky extrusions and all – and if I’m not printing something, I feel that I’m wasting valuable print-time! A passive coin sorter – darn you, US 1¢ coin vs. 10¢, with your 1mm difference in diameter! A hairbrush with replaceable bristles, and interchangable handles – for different firmness and length of bristles, and different, customized ergonomic handles. Updates to my glowstick candelabra – collaborating with a smart gent to make a version that can be wired for LED use. …And new stuff every day. I’ll wake up too early, lie in bed trying to sleep, and then BAM – new idea for a 3d printed thing will hit me. Then, it’s only a matter of time before I sneak over to the laptop and start modelling it. So what comes along to make my addiction worse? MakerBot TV – a new web video series that looks at developments at MakerBot (the creators of my Thingomatic), gives advice on the use of ReplicatorG (the tool I use for 3d printing) and then features some of the objects at Thingiverse (where I upload all my designs and avidly watch other designs being uploaded). There’s no saving me, it would appear. Another 2 year obsession has hit, and hit hard. My last one was Steampunk, a few years ago, and I’ve been experiencing the calm before the storm, waiting for the next one to hit. Well, this is it! 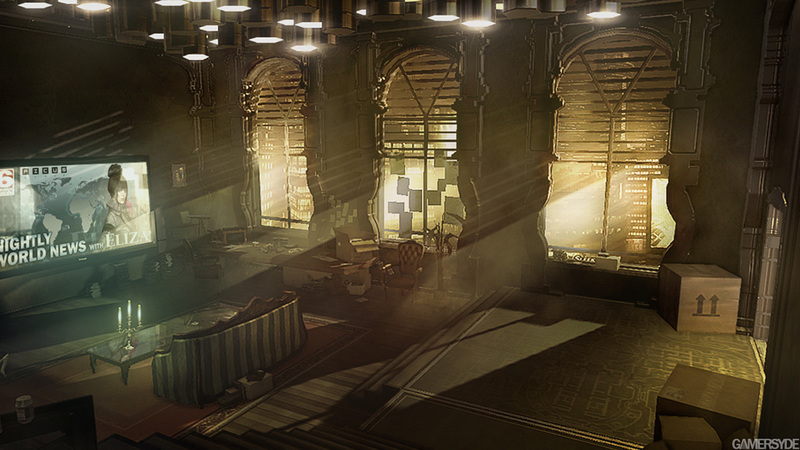 I’ve been playing Deus Ex: Human Revolution, and reveling in the stealth-puzzle options available to me. It means I spend a lot of time in one area, creeping around like the Creeping Kid, and because I’ve turned off the object highlighting and mission arrows, I need to actually look at the environments. One environment that struck me more than many others, was Jensen’s apartment – the second the artificially intelligent door opened for me, I was drinking in the strong Bladerunner vibe. Noir-ish lighting spills through room high, slatted windows, casting long dark shadows across the jumble and accumulated debris of Adam’s life and upheaval – it feels like a refugee from Tron was put under house arrest in a long abandoned, 18th Century Parisian flat. In short, I liked it.